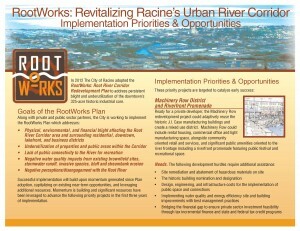 RootWorks: Revitalizing Racine's Root River Corridor | Vandewalle & Associates, Inc. The RootWorks Plan envisions the rebirth of the Root River Corridor as the heart of the City and a hub for economic growth. The strategy responds not only to the needs and opportunities within the Corridor, but also the economic needs of the entire community. Since the Plan’s adoption in the summer of 2012, its project partners–including the City of Racine, Racine County Economic Development Corporation, Root River Council, SC Johnson, and Vandewalle & Associates–have been engaged in Plan implementation.